The picture above is the 6th Green at Hilldale. This photo was taken shortly after noon today (Sat.-19th). 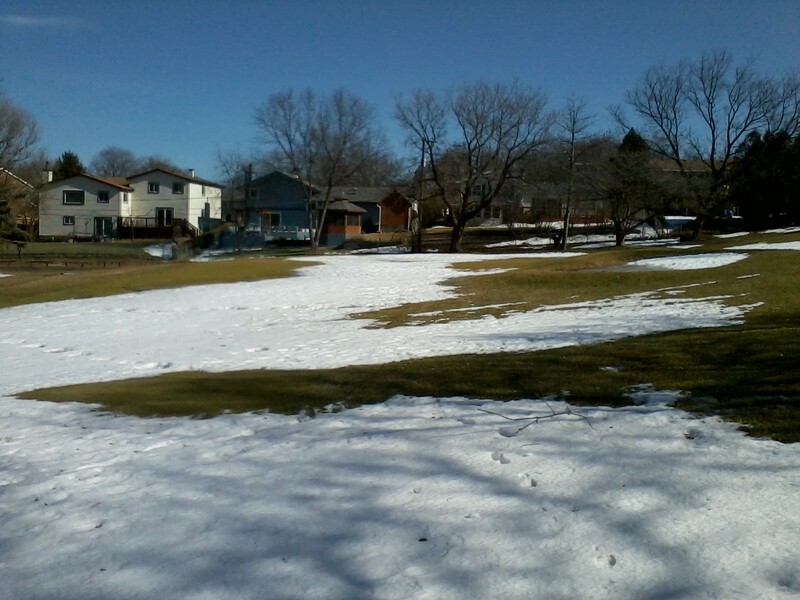 As you can see, we still have too much snow in important areas on the golf course (greens, fairways) to enable opening for play. I have no doubt that spring fever is building up in everyone with the beautiful weather we’ve been having. I do hope to open the golf course in the near future, but with current conditions (very wet) and a forecast calling for rain, sleet, and light snow…it is hard to say when that might be. Turf conditions will undergo many freeze/thaw cycles in the coming days, and the stress that puts on grass plants is very harsh. Combine that with foot traffic from golfers and the risk of doing damage to our greens is increased. Thanks for checking in…please visit this site or call Hilldale’s proshop at: 847-310-1100 for updates as Spring draws closer. This entry was posted on Saturday, February 19th, 2011 at 8:13 pm and is filed under Uncategorized. You can follow any responses to this entry through the RSS 2.0 feed. You can leave a response, or trackback from your own site.